The best-tasting tomatoes are picked just when they ripen into a bright red. To beat the bugs to the reward, however, gardeners might need to pick when the skin begins to turn from green to pink. Ripen on a windowsill or your kitchen counter. 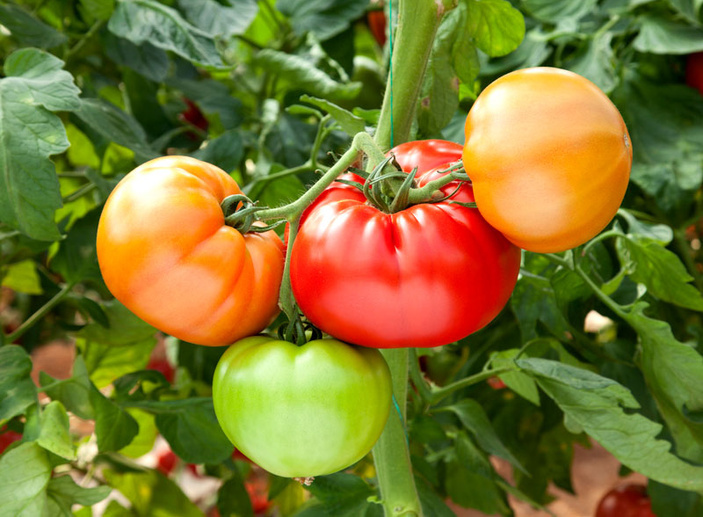 Green thumbs aren’t necessary to produce juicy, delicious tomatoes, according to Ricky Lane, Master Gardener and project manager of The Helping Center of Marble Falls garden. Anyone who follows Lane’s simple guidelines for growing in the Hill Country heat can enjoy Mother Nature’s sweetest fruit — disguised as a vegetable — from spring to fall. By April, it’s too late to start plants with seeds. Lane suggests buying starter plants — the bigger the better. His favorites are Early Girls for indeterminate plants — the ones that grow into vines — and Celebrities for determinate plants — the ones that grow into bushes. Dirt is a dirty word in Lane’s world. He favors compost or purchased soil — NOT to be confused with potting soil. Too much water and the skin of the tomato splits open. Not enough and the plants don’t produce. Lane uses a drip system, 15 minutes a day. He strongly suggests investing in a timer. All the gardener needs to do is pay attention to the weather. “If it’s going to rain the next day, turn off your drip,” he advised. Whether determinate or indeterminate, healthy tomato plants need a cage to hold them up. Productive plants need the support, but, more important, tomato leaves should never, ever touch the ground. Lane suggests wire with holes big enough to stick a hand through to make harvesting easier. For soil or compost that is not quite strong enough to support juicy tomatoes, Lane uses organic fertilizer throughout the growing season. He fertilizes, or amends the soil, once a week as the plants get started then every other week as they begin to produce. Once you have your plants and support system in place, Lane has a few extra tips for how to reap the biggest rewards. Prepare your soil for sweeter tomatoes by sprinkling a light covering of epsom salt over the area where you plan to plant tomatoes. You can add coffee grounds, too, then turn it all over together into the soil. After taking a plant out of its pot, carefully loosen the soil around the roots. Loosen soil in the planting hole as well to make it easier for roots to spread out. A strong root system feeds the fruits for the most succulent yield. Before planting, clip — don’t pinch — the lower leaves from the stem of the plant. Make sure the dirt covers that area of the stem when planting. Each spot where a leaf was clipped will grow roots, resulting in a healthier plant and higher yield. Lane also plants indeterminate tomatoes at a 45-degree angle along the ground, which results in more roots growing from the stem into the soil. Tomatoes don’t like company — especially each other’s. Plant tomatoes 3 feet apart with marigold or basil in between each in any combination. They will all thrive together. Tomatoes are heavy feeders. The healthier this year’s plants, the more depleted this year’s soil will be when the season is over. Either plant in a different spot next year or make plans to replace the old soil with new compost once you’ve harvested all your tomatoes. Don’t throw out your garden waste, including dead tomato stalks. Mulch or compost everything back into the garden to feed the next generation. Following these easy tips should produce more tomatoes than can be eaten on a daily basis, said Lane, who turns his overflow into salsa, chow-chow, and hot sauce. He also freezes tomatoes whole for use later in the year when America’s favorite fruit is out of season. Lane’s favorite way to eat tomatoes is off the vine, still warm from the summer sun, sprinkled with a little bit of pepper. For more gardening tips and local experts, check out the Highland Lakes Lawn & Garden Guide. And pick up a copy of the April edition of The Picayune Magazine for a special Home and Garden section or flip through the digital version here.